On that one November day everyone has a role to play. From the runner, the volunteer, the participating NGO, the cheerer, to the coffee shops around Beirut and the fully booked restaurants. The whole vibration of that day fills the heart of our city and our nation, and indeed it calls for one massive celebration. You’re in for a treat. We have been working very hard to locate the perfect course for the runners and we are happy to announce that we found the best one! This year will guarantee the smoothest, flattest, easiest and most cheerful course to date. With 195 NGOs to choose from, you can now easily dedicate your run to a cause by selecting the charity of your choice on our online registration platform. 25% of the race registration fees go straight to support the NGO's mission and objectives. 1. 42.195 KM MARATHON: A distance you run with heart, body and mind. Be ready for a memorable experience. Prepare yourself to break your personal record or achieve an outstanding one. 2. 42.195 KM RELAY RACE: Experience the spirit of the Marathon by sharing it with 6 teammates, family members or friends. 3. 42.195 KM PARA-ATHLETES: This race welcomes participants with different physical capabilities. Show your potential by participating in this race and get a chance to prove yourself. 4. 42.195 KM JUNIOR RELAY RACE: 10 junior runners, between 14 and 18 years old, will run 4.2 KM to complete the full marathon distance. 5. 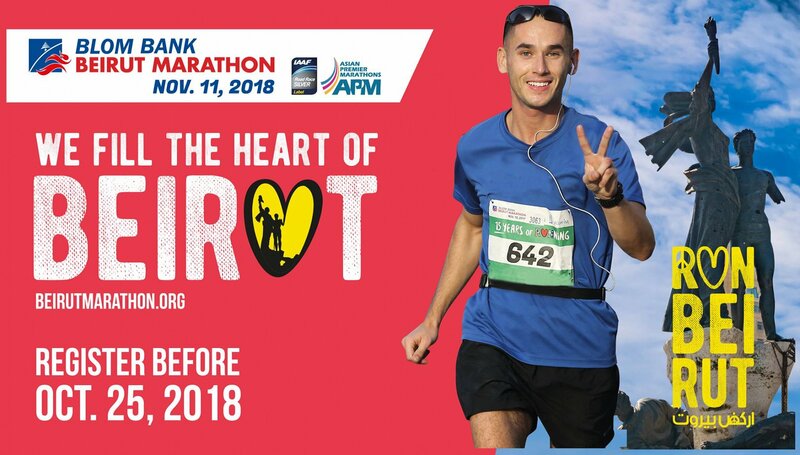 21.1 KM HALF-MARATHON: After the massive success of this distance in 2016, we are introducing this IAAF measured course again with a twist in the course and a bigger crowd. 6. 8 KM RACE: You asked, we listened! Bringing back a short, fun distance to run and challenge yourself in a competitive atmosphere. And Why 8 KM? Because it just happens to be a certified Olympic distance. The race will be measured and follows IAAF rules. 7. 8 KM PARA-ATHLETES: Explore your capabilities and reach your best potential through a fun and enjoyable experience. 8. 5 KM YOUTH RACE: The most competitive race for youth aged 10-17. This specific run is filled with hopeful dreams and high objectives of achievement and glory. 10 . 1 KM PARA-ATHLETES: This race welcomes participants with disability. 1. FUN RUN (8 KM): Everyone’s favorite run, a festival of colors, causes and sheer happiness. Be part of the joy that has united the Lebanese for 15 years over the same start, same course and same finish line. 2. 1 KM RUN WITH PARENT: No one is too young to run. Parents experience the thrill of running with your babies by taking part in this awesome happy run. Strollers are allowed. Dear Runners, this November 11, be part of a story that’s bigger than sports, Register now! - Beirut Marathon Association office – Hazmieh – Said Freiha St. Makateb Bldg – 4th Floor (9AM-5PM).